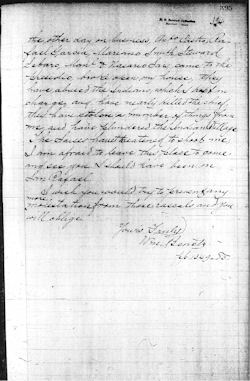 In late July, 1845, while William was absent from Fort Ross, a group of rancheros from Sonoma and Marin counties raided the fort and the neighboring Indian village. 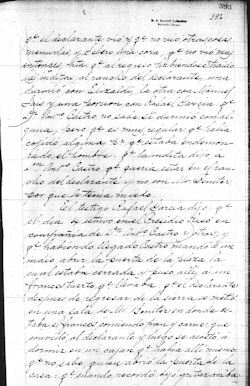 Following the complaints of Capistrano Juarez and William Benitz, the Mexican court at Sonoma reacted quickly — in August of the same year. “The Works of Hubert Howard Bancroft, vol. 21 - History of California”, page 544. None of the native Indians, the victims of the raid, were identified by name in the court proceedings. The Indian women taken from William’s attic could have been part Russian, left as caretakers at the fort by the Russians when they departed in 1842. It is almost certain they were kept by William and Charles T. Meyer, his partner in the rental of the fort; both men had children with native Indian women. Had the raid occurred a year later, in July of 1846, Josephine Kolmer could have been the target of the rancheros’ brutality. Whether they would have gang-raped a European woman is unknown, but they clearly held William in disdain and believed themselves sufficiently remote at Fort Ross to be beyond the reach of the law and censure of civilized society. 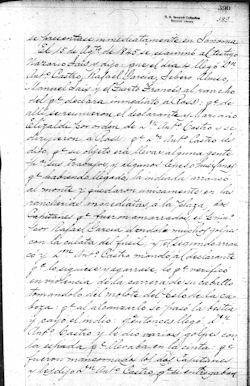 Spanish/Mexican: Though the Mexican constitution of 1824 declared native Indians to be citizens with the right to vote and hold public office, they continued to be considered chattel, a concept embraced by the Mexican landowners of California, adopting it from the Spanish missions that had preceded them. 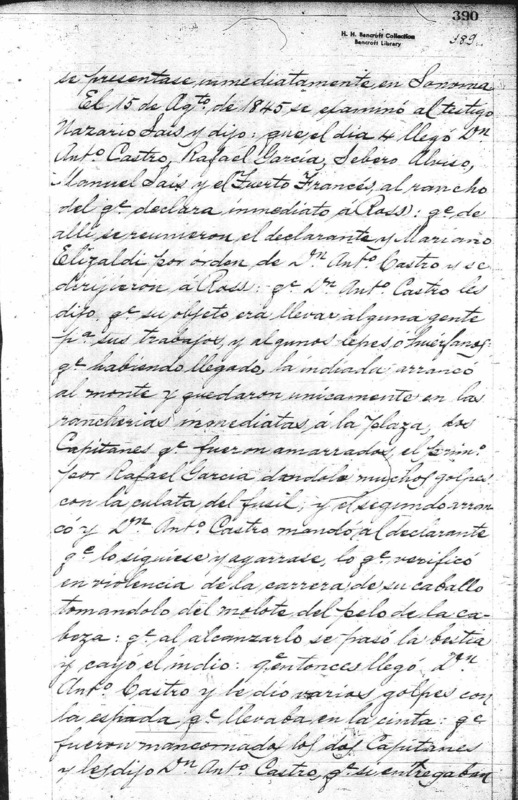 The Spanish missionaries, though well intentioned to civilize (Europeanize) the natives, had in practice restricted them to living on and working for a particular mission; though not held for profit, the practice had been a form of slavery. Anglo-European: During the first two years of the Gold Rush (i.e. prior to 1850), the land-hungry miners killed an estimated 100,000 native Indians, or about 2⁄3 of the native population of California. Though California joined the Union in 1850, it denied native Indians citizenship, the right to give testimony in court, and enacted laws legalizing their slavery. One such law allowed a system of indenture which evolved into a practice of killing the parents so their orphaned children could be taken into indentured service, essentially as slaves until age 25 or 30, female or male, respectively. The law was repealed in 1863. 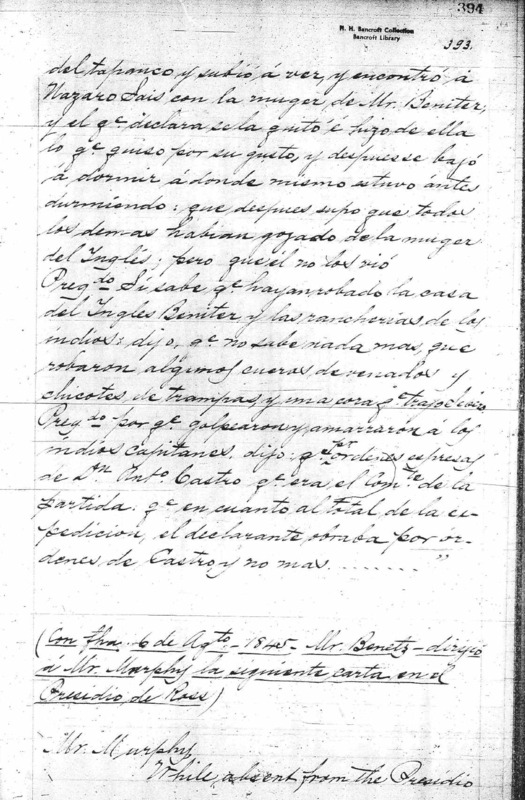 The court records of the case were summarized in hand-written colloquial Spanish. It reads as if the person writing it was in a rush with no time to correct grammar and verify the spelling of people’s names. The summary is now in the “Archives of California” at the Bancroft Library, Univ. of Calif., Berkeley. 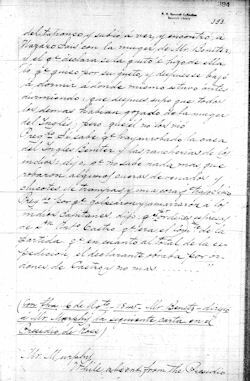 The following is our transcription and translation of that summary: C-A 39 Tomo V, pages 384-395. 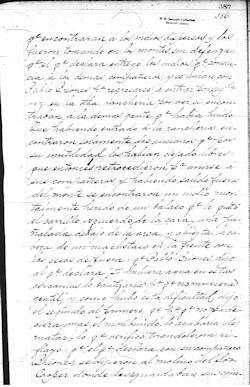 Español Mexicano: Transcribido tal cual, sin modificación alguna. Al fondo incluimos una lista de las abreviaturas con nuestras interpretaciones de ellas. English: In the translation, we have attempted to retain the same run-on sentences and awkward structures, but without the abbreviations used in the Spanish text. We corrected the spelling of Benitz (i.e., was Benitez). 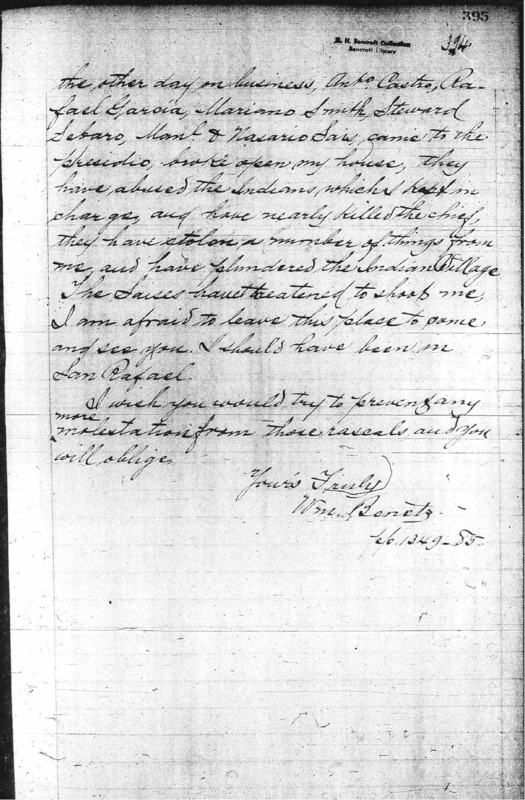 We validated our translation with, and included some local terms and spelling of people’s names from: “Two Accounts of Raids for Indian slaves at Yocarya and Fort Ross in 1845”, by Glenn J. Farris, Ph.D., Associate State Archeologist Archeology Lab, DPR, an unpublished manuscript in possession of the author. 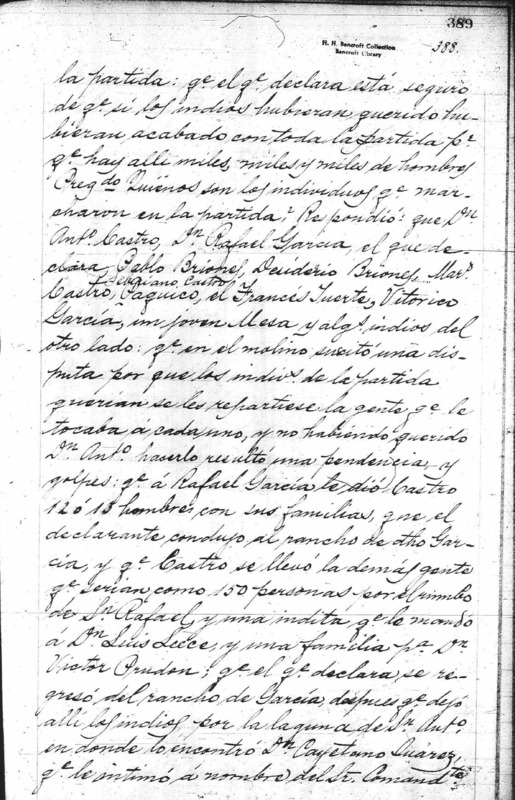 At the foot of the table, we include a list of names and details about the people taken from the same work. We thank Dr. Farris for his generous assistance. Proceso contra Anto. 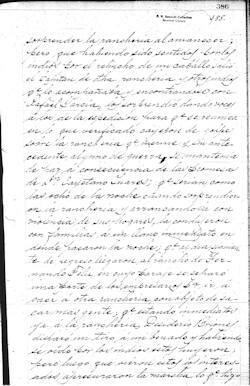 Castro y sócios acusados de haber extraido á mano armada una porcion de Indios Gentiles. Proceedings against Antonio Castro and associates accused of having taken by force of arms a group of pagan Indians. compañeros; qe. esto sucedió el dia 29 de Julio pa.po. Pregdo Sí sabe quien hirió al indio moribundo, qe. encontraron él y Pablo Briones. Repondió _ qe. sabe lo hirió Seberiano Castro pr. qe. el mismo lo dijo, al qe. 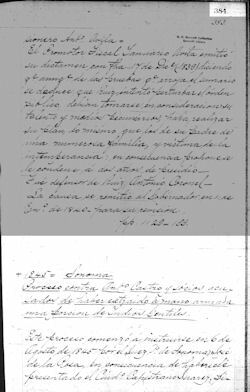 declara en presencia de Pablo Briones, Desiderio Briones, y Mariano Castro, Vitorico García y un Francés Tuerto, qe. no conoce de nombe. Pregdo Sí sabia qe. 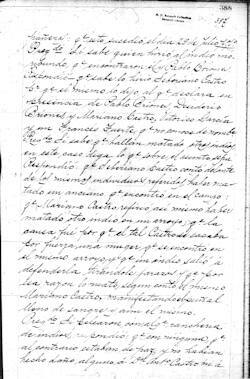 hallan matado otros indios, en este caso diga lo qe. sobre el asunto sepa. Respondió: qe. Sebariano Castro contó delante de los mismos individuos referidos, haber matado un anciano qe. encontró en el campo: qe. Mariano Castro refirió así mismo haber matado otro indio en un arroyo; qe. la causa fué por qe. el tal Castro se sacaba por fuerza una mujer qe. se encontró en el mismo arroyo, y qe. un indio salió á defenderla tirándole jarazos y qe. por esa razón lo mató, según contó el mismo Mariano Castro, manifestando el puñal lleno de sangre y aun él mismo. their colleagues were waiting for them: that this happened on the 29th day of July past. Asked: Did he know who wounded the dying Indian, that he and Pablo Briones found. 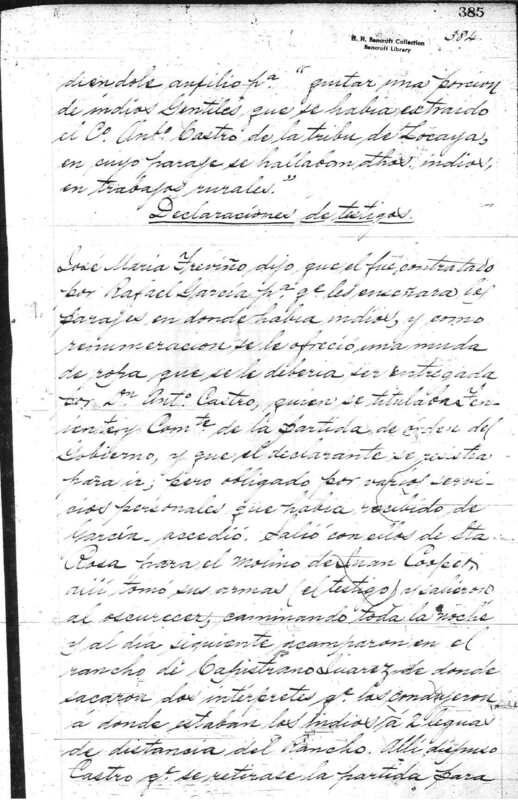 Answered: He knows Seberiano Castro had wounded him because he said so himself, to the witness in the presence of Pablo Briones, Desiderio Briones, and Mariano Castro, Vitorico García and a One-Eyed Frenchman, whom he didn’t know by name. Asked: Did he know if they had killed other Indians, in which case tell what he knew on the subject. 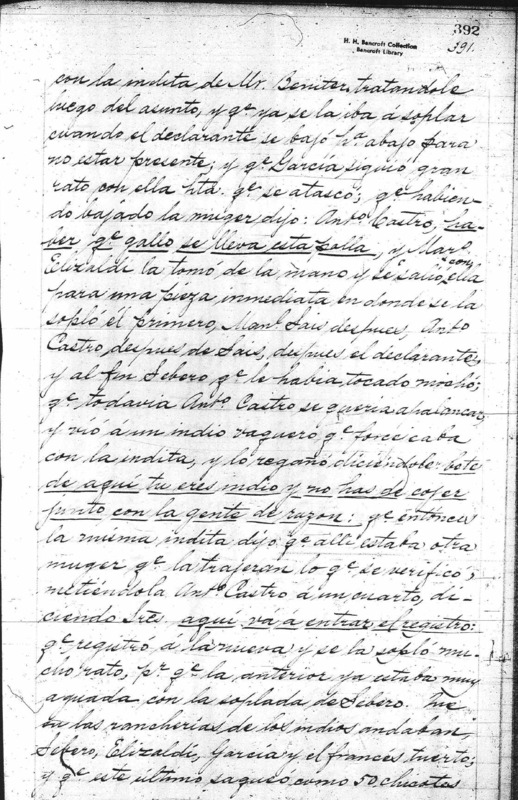 Answered: That Seberiano Castro described, in the presence of the same individuals mentioned, having killed an old man whom he found in the fields: that Mariano Castro referred to himself as having killed another Indian in a creek; the reason was that the said Castro was forcibly removing a woman he had found in the same creek, and that an Indian came out to defend her throwing wooden spears and for that reason he killed him, as told by the same Mariano Castro, showing the dagger covered in blood and even himself. Pregdo Quienes son los individuos qe. marcharon con la partida; Respondió: que Dn. Anto. Castro, Dn. 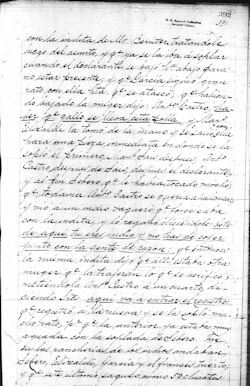 Rafael García, el que declara, Pablo Briones, Desiderio Briones, Mars. Castro, Seberiano Castro, Paquico, el Francés Tuerta, Vitorico García, un joven Mesa y algs. indios del otro lado: qe. en el molino suscitó una disputa por que los indivs. de la partida querían se les repartiese la gente qe. le tocaba á cada uno, y no habiendo querido Dn. Anto. hacerlo resultó una pendencia y golpes: qe. 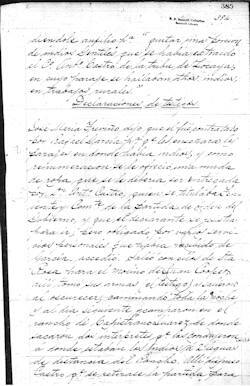 a Rafael García le dio Castro 12 ó 13 hombres con sus familias, que el declarante condujo al rancho de dtho García, y qe. Castro se llevó la demás gente qe. serian como 150 personas por el rumbo de Sn. Rafael, y una indita qe. la mandó a Dn. 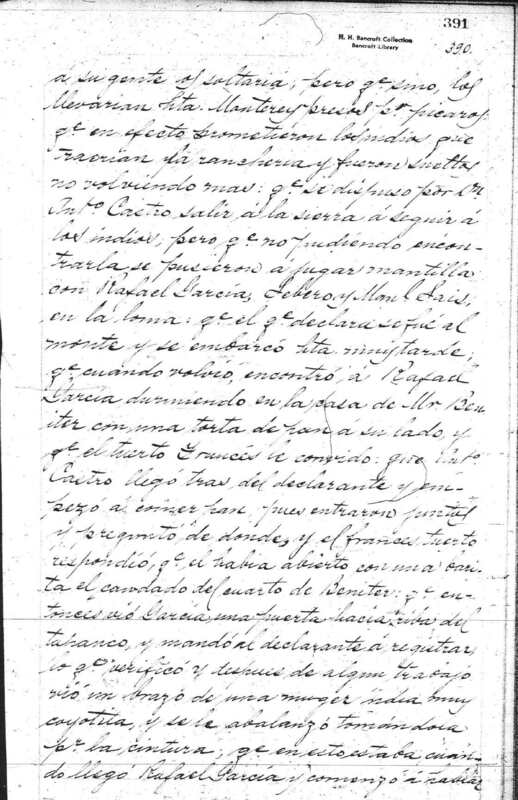 Luis Leecs, una familia pa. Dr. Victor Prudon; qe. el qe. declara se regresó del rancho de García, después qe. 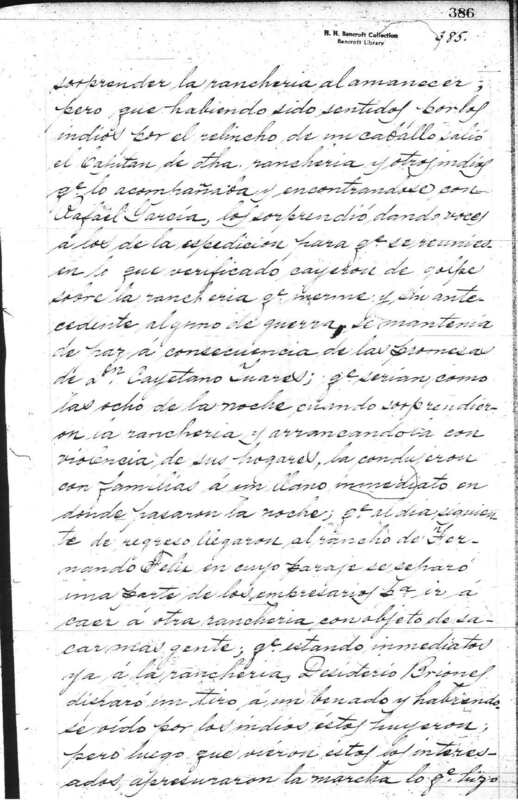 dejó allí los indios por la laguna de Sr. Anto. en donde lo encontró Dn. 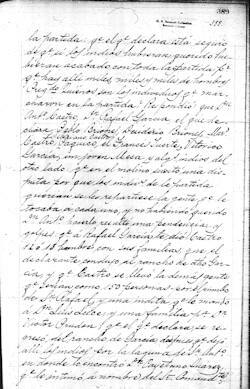 Cayetano Suarez, qe. 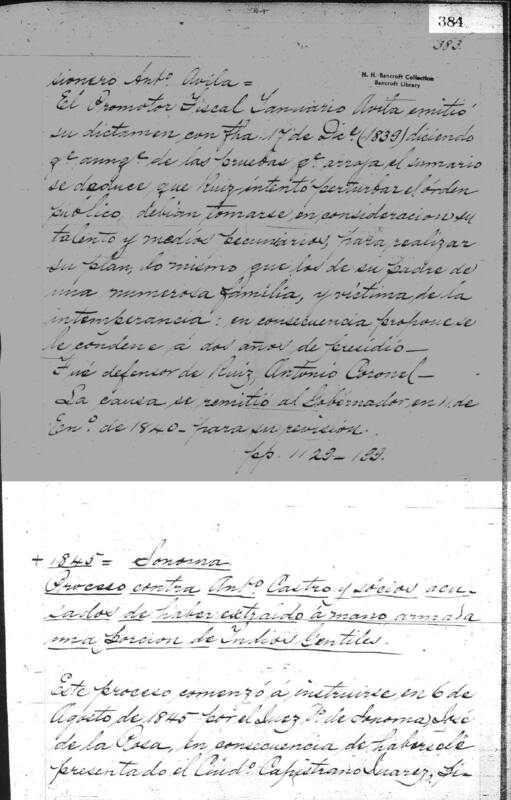 le intimó á nombre del Sr. Comandte. the party: that the witness is sure that if the Indians had wanted to they could have finished off the entire party because there are there thousands, thousands and thousands of men. to appear immediately in Sonoma. qe. el declarante vió y qe. 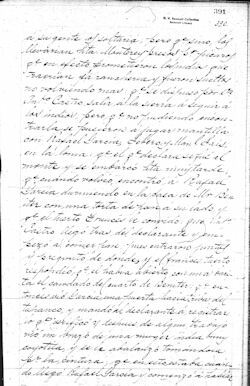 no vió otras cosas menudas, y Sebero una cora [basquet G.Farris)]; qe. no vió mas entonces, hta. qe. al regreso habíendose traído las inditas al rancho del declarante, una durmió con Elizaldí, la otra con Manuel Sais y una porcion con Rafael Garcia: qe. Dn. Anto. Castro no sabe si durmió con alguna, pero qe. es muy regular qe. había cojído alguna pr. qe. estaba endemonádo al hombre: qe. la indita dijo á Dn. Anto. Castro qe. queria estar en el rancho del declarante y no con Mr. Benitez, por que le tenía miedo. 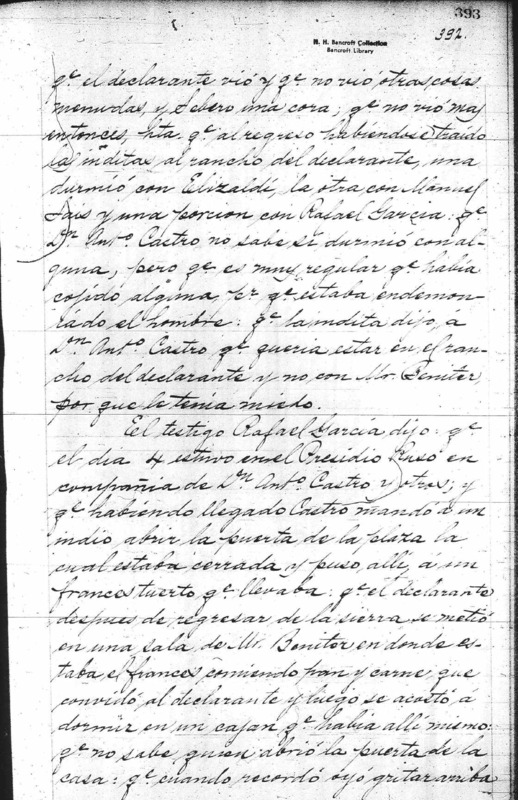 that the witness saw and that he didn’t see anything else useful, and Sebero a cora [basket (G.Farris)]; that he then didn’t see anything more, until the return having taken the Indian girls to the witness’s ranch, one slept with Elizaldí, the other with Manuel Sais and a bit with Rafael Garcia; that he doesn’t know if Don Antonio Castro slept with one of them, but it is very likely he had had one of them because he was crazy that man: that the Indian girl told Don Antonio Castro that she wanted to stay at the witness’s ranch and not with Mr. Benitz because she was afraid of him. Pregdo Sí sabe qe. hayan robado la casa del Inglés Benitez y las rancherías de los indios: dijo qe. no sabe nada mas, que robaron algunos cueros de venados y chicotes, de trampas, y un cora [basquet G.Farris] qe. trajo Severo. the loft above and he went up to see, and found Nazaro Sais with Mr. Benitz’s woman; and that the witness states he took her from him and he did with her as he pleased, and that he then came down to sleep where he had been sleeping before: that he later knew all the others had enjoyed the Englishman’s woman; but that he hadn’t seen them. 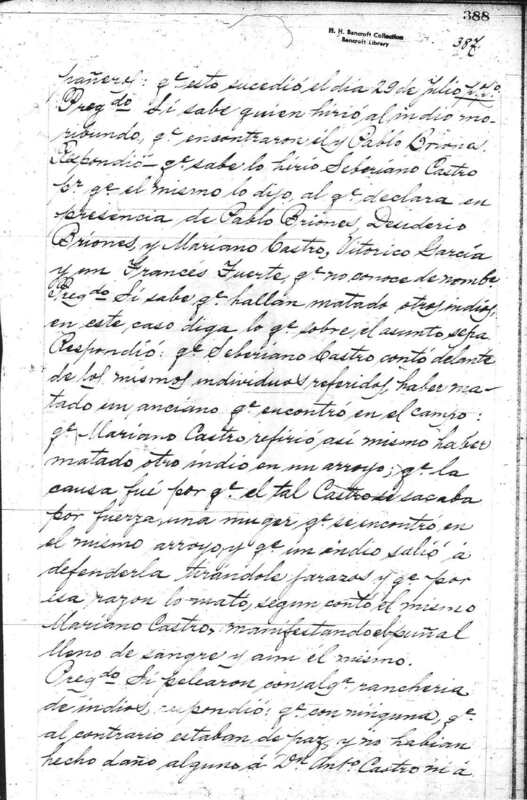 Asked: Did he know what they had stolen from the Englishman Benitz’s house and the Indian villages: he said that he didn’t know anything more, that they had stolen some deer skins and cigars, traps, and Severo took a cora [basquet (G.Farris)]. The Saises have threatened to shoot me, I am afraid to leave this place to come and see you. I should have been in San Rafael. I wish you would try to prevent any more molestation from those rascals and you will oblige. 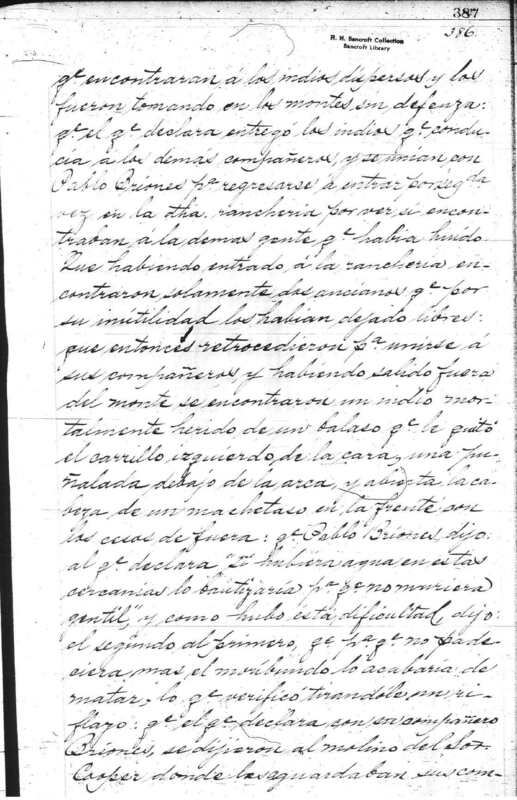 Saíz, Nazario - José Nazario Justo Sáez, employed by ranchos in Sonoma & Marin cos.
mantilla — a game played with a head-scarf? (p.391); per G. Farris: a game of tossing cow chips (cow-patty frisbie? ).